Reuse Old Calendars - Extreme recycling! For the truly dedicated recycler, here's a little something crazy: old calendars from specific years can be reused decades later, when the days and dates match up again. 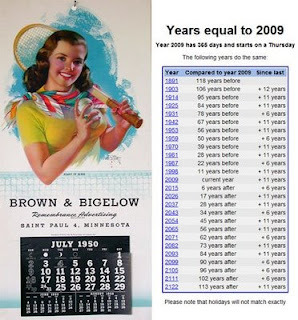 TimeAndDate.com has a page that calculates which old (and future) calendars will work for any given year. Just beware, as they point out, "holidays will not match exactly" - or in the case of some such as MLK day, won't even exist! It may take a lot of patience to wait decades to reuse a product - but for those seeking recycling nirvana, it just may be worth it.